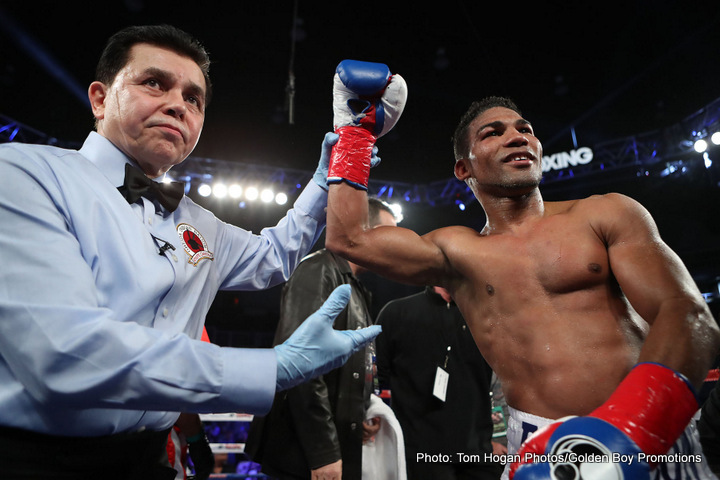 Last night in Cancun, Mexico, 35 year old Yuriorkis Gamboa kept his career alive with a win – but only just. The once seemingly untouchable Cuban scraped through with a ten round MD over Mexico’s Alexis Reyes, prevailing by scores of 95-94 twice in the 135 pound bout, the third judge seeing things all square at 94-94. Gamboa is now 27-2(17), 22 year old Reyes, who has never been stopped, is now 15-3-1(7). It was very much a case of must-win for the former three-weight champion last night, as Gamboa was coming off that shocker back in May of this year when Robinson Castellanos stopped him via upset corner retirement (Gamboa saying he simply got dizzy in that fight). Gamboa got the win last night, but only just. No longer the special fighter he was back in 2010 and 2011 when he was arguably at his peak – beating such good fighters as Orlando Salido, Jorge Solis and Daniel Ponce de Leon – the Gamboa of today appears more hittable than ever (he never had an airtight defence) and vulnerable. It was lucky for him how Reyes is no big puncher. Gamboa looked good in bursts, and he still has those fast hands, but he no longer looks like a world-beater. Reyes thought he’d done enough to have won last night and quite a few people agreed with him. Coming off an even closer decision defeat, a split decision loss to an unbeaten Alejandro Zuniga in November of last year, Reyes will likely be thinking he just cannot get a break. Gamboa, though, because of his big name and because of the fact that he is still involved in exciting fights, will likely get himself a somewhat big opportunity in the coming months. If the decision had gone against him last night, however, we might today be saying goodbye to Gamboa, a fine fighter who never lived up to the lofty expectations many good judges had of him. In an ideal and fair world, Gamboa and Reyes would meet up again in a rematch.